We have been having a terrible time figuring out the rug for our living room. I believe we are actually on our 4th rug (so far). 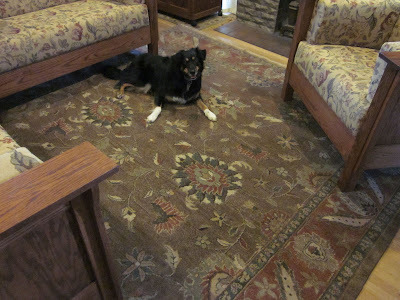 We changed rugs so often, I even stopped bothering to mention it on the blog. Well, for the short version of this post, I ordered a new hand-knotted rug. 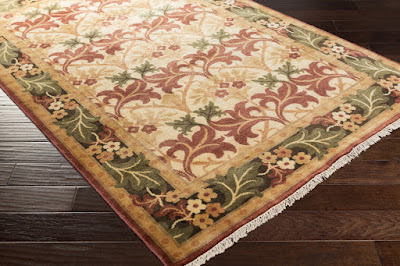 I have been lusting over hand-knotted rugs since we moved in. We already owned two of them from our last house so I know how great they are. Though, the ones leftover from our last house aren't the greatest match for our decor here, but for what we spent on them, we'll live with them. So far in this house, I keep buying hand-tufted rugs in order to save money, and I think I've decided it's just not worth it for us. Perhaps if we had no kids and no dogs, they would be fine, but they just haven't proved to be very durable. At one point Shasta took to obsessing about the rugs and she managed to lick holes in our beautiful hand-tufted rug in our dining room which eliminated any resale value. Anyway, back when we ordered our living room furniture I had a couple fabric options and I ended up going with the lighter one and now that we've got 2 dogs, I regret it. Looking back, I wish I had just gotten the purple fabric and purple hand-knotted rug. Oh well. At the time, I thought spending less money on the rug was a feature. But I have learned over time, you basically get what you pay for. 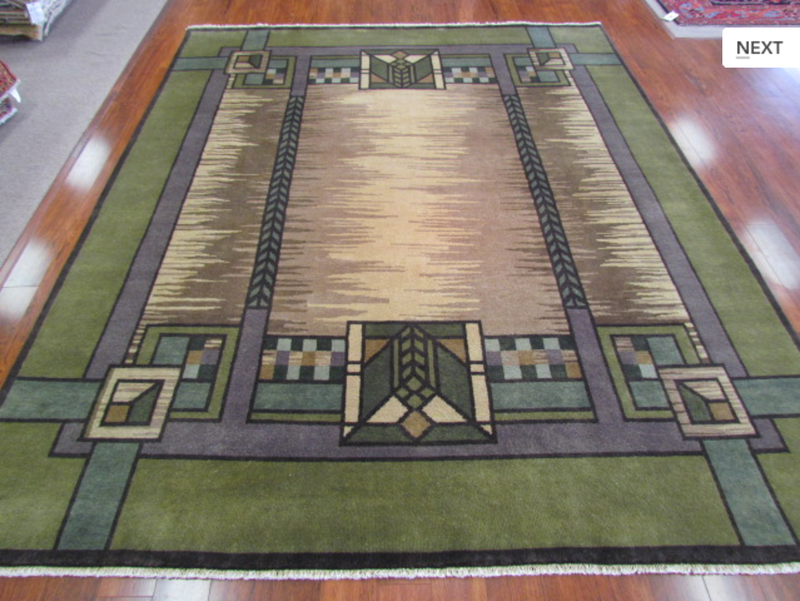 Rug #3: This was a hand-tufted rug and the colors coordinated nicely, but it was just too small. I resold it pretty quickly on craigslist for close to what I paid. This is our current rug. It's a hand-knotted rug I got off Craiglist. It looks OK, but it's just too brown for my taste. I've been poking around online rug sources for months looking for a better alternative. I've been really tempted by the clearance rugs at Persian Carpets, but I just don't love any of them right now. I was strangely tempted by this prototype rug they have right now, but while the colors are great, the style doesn't match anything in our house. I think it would have looked lousy with the tapestries. Ever since we bought this house, I've been repeatedly drawn to the Fintona rug design. Recently I found a hand-knotted one that came in perfect colors for our house. I've been watching it for weeks, hoping to find it on sale. Well, this weekend I found a site that had it for an additional 20% off, so I ordered it. I really hope that the 5th time's the charm and we'll be done buying rugs for our living room. I'm also considering changing the fabric on the loveseats. With the dogs and the amount of rain (mud) we get, the fabric is looking pretty dirty. I am hoping to borrow/rent a steam cleaner to clean them up once summer arrives, but I am also in the market for new fabric. Something a little darker. Fabric choices for affordable fabrics are awful this year, so it will no doubt take me a while to find fabric. Or I'll eventually cave and buy fabric from Archive Editions. Update: I found this website and this website that explained the differences between hand-knotted and hand-tufted rugs. Thank you. Yeah, the hand-knotted rugs are more durable, but much more expensive. The hand-tufted rugs are more like bits of wool glued onto a backing and the threads can be pulled out fairly easily, as evidenced by our dog child. It really a matter of you get what you pay for.